New Hope Women of Today: Wine, Women and Wii! Come join in the fun as we bring back a favorite, Wine Women and Wii on March 10th starting at 6:30 pm at Carrie A's Home. Bring a friend or show up alone, either way come ready to play. R.S.V.P. by calling or emailing Carrie A. 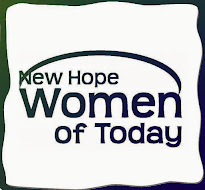 For more information on NHWT events email Membership@NewHopeWT.org.